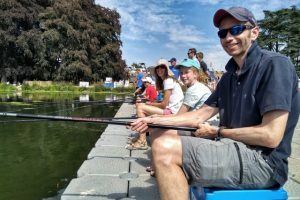 Angling reached another milestone this summer when over 1,000 people had a go at fishing during what has been billed as "this summer's best day out", BBC Countryfile Live 2018. Completely free fishing sessions for newcomers organised by the UK's largest angling charity Get Hooked on Fishing were one of the show's main draws. Families keen to discover the wonders of angling hurried to the waterside area to book places, and each of the 4 days of fishing were fully booked before midday. Hundreds of roach and perch were caught by beginner anglers during simple lessons provided by Get Hooked on Fishing. Volunteers helped participants to understand the basics of fishing and provided information on where to go next to find family-friendly venues and affordable equipment. Get Hooked on Fishing also created a 'Fishing Funfair' area with graffiti-art from Dusto. This attracted hundreds more families and children to come and get involved, with angling themed games to teach them the skills involved in fishing. BBC Countryfile presenters were keen to have a go at fishing too and Get Hooked on Fishing were thrilled to host Anita Rani, Carol Kirkwood, Helen Skelton and Sean Fletcher who all took time out of their busy schedules to relax by the waterside with a fishing rod! All these stars of the show expressed their interest in Get Hooked on Fishing's work to provide positive opportunities for young people and communities through angling, and The One Show's Mike Dilger pledged his support for Get Hooked on Fishing too. 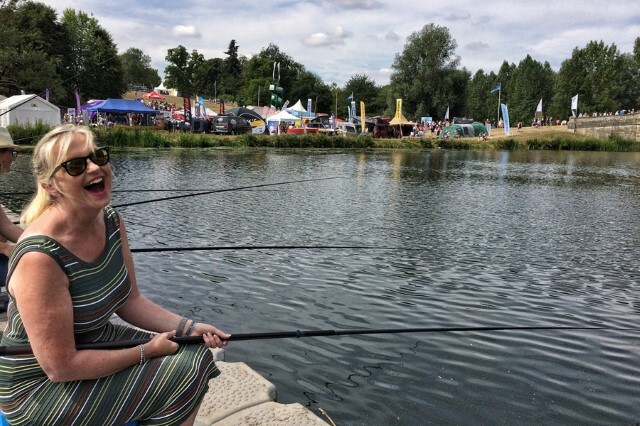 Sarah Collins, Chief Executive of Get Hooked on Fishing said: "To yet again have the opportunity to expose a huge non-angling audience to the amazing experiences that fishing can offer their families is another step to boost participation in this healthy, inexpensive and relaxing activity. The Get Hooked on Fishing Team are particularly thankful to the BBC and SME for providing us with the space and promotion, to Faye Hatcher for the opportunity to be on the 'Explore Britain Stage' and to all of the thousands of people who came and made BBC Countryfile Live 2018 such a huge success for angling." Look out for the fishing feature in BBC Countryfile on BBC 1, 19th August 2018 and find more events like this at www.getfishing.org.uk.